While the lighting setup used during the scan process minimises colour or hue inconsistencies, slight variations in brightness occasionally occurred between scans on an object (see Fig. 2). 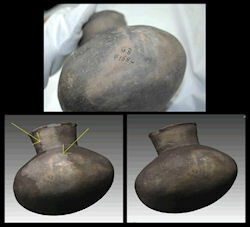 Figure 2: (Top) Photo of artefact. (Bottom left) Brightness variation between scans. Note variation is not present on object in photo. (Bottom right) Completed model with brightness variation corrected in Rapidform. Because Polyworks did not have built-in functionality to adjust a scan's colour or RGB value, objects that needed additional colour correction were exported at this stage and adjusted in Rapidform XOR (from Inus Technology). In Rapidform, the processor operator can adjust the hue, brightness, contrast, and other colour properties of a scan. Despite the more advanced colour editing tools in Rapidform, some artefact models cannot be accurately colour corrected and any model where the colour is judged as not accurately representing the original artefact had the colour completely removed from the final digital product and the model was published only as greyscale. The comments facility has now been turned off.